It's high time for some Valentine cards. The season goes by so quickly and I wanted a chance to play some more with my Valentine's sets. I had an idea to combine background bokeh images from the Beauty Abounds stamp set with the Forever Lovely bundle to come up with a pretty combination for Valentine's Day. 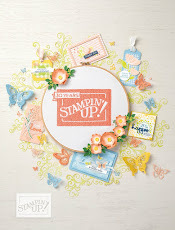 Both these stamp sets are gorgeous with delicate images and the Lovely Flowers Edgelit Dies, which are bundled with with the Forever Lovely stamp set, has some exquisite die cuts to go with them. Layered on the Crumb Cake card base is a panel of All My Love Designer Series Paper. Then another background layer is stamped on the Whisper White panel on top of that. The sentiments from Forever Lovely were stamped in Lovely Lipstick. Flirty Flamingo and Mango Melody were stamped off one or two times and used to stamp the two bokeh stamps. (The bubbles you can see in the background. Flirty Flamingo was used for the hearts, also from the Forever Lovely set. The Stamparatus came in very handy for positioning the Soft Sea Foam foliage around the Lovely Lipstick flowers on the cross panel. 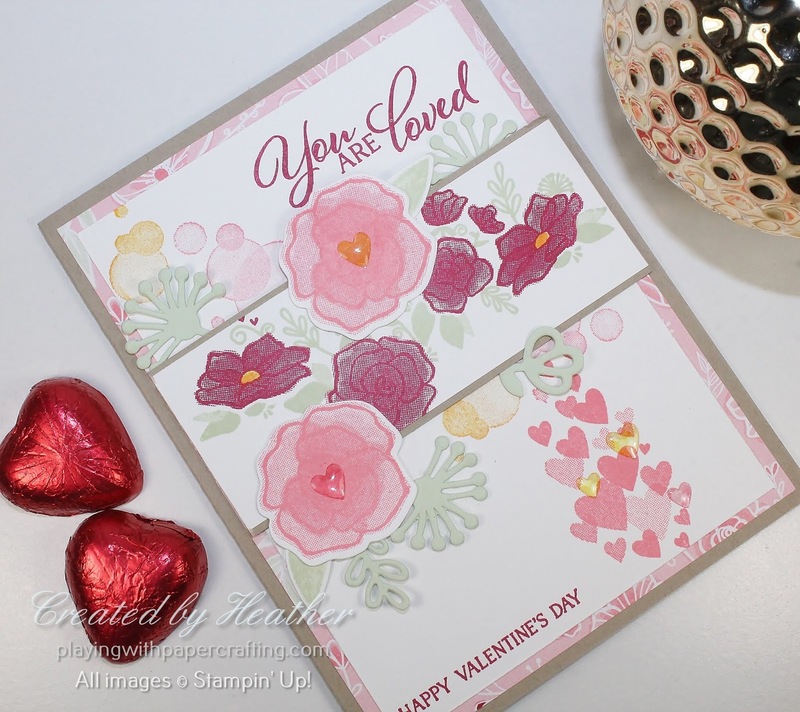 This is because you could secure the panel with the flowers already stamped on, with the Stamparatus magnets, then position the uninked stamp face down exactly where you want it right on the panel before picking it up with the Stamparatus plate. Then you can ink it up and stamp, confident it's going to be exactly where you want it. 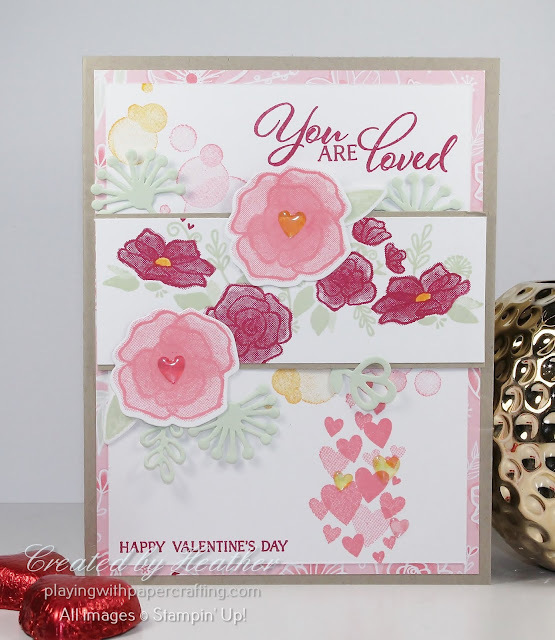 Stamp a couple of the larger flowers in Flirty Flamingo and die cut them with Lovely Flowers Edgelit Dies, along with stamped leaves and foliage die cut from Soft Sea Foam. Add them to the cross panel using Glue Dots. 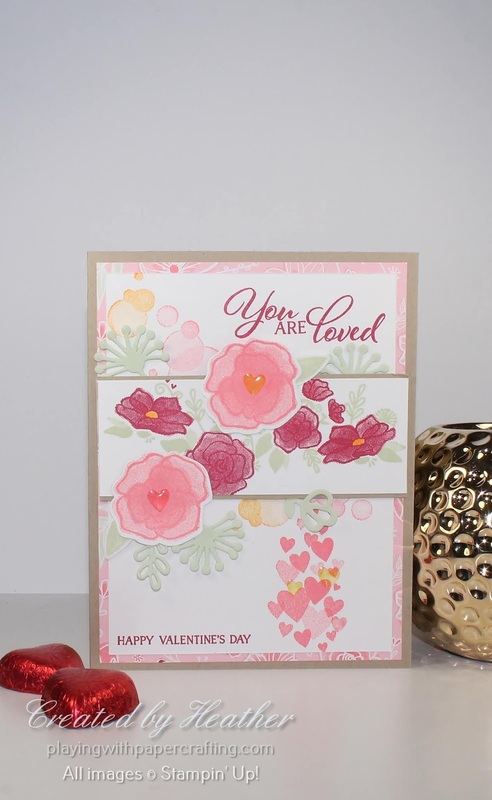 Heart Epoxy Droplets, coloured with Stampin' Blends Flirty Flamingo and Mango Melody, dark shades, were added as shown for accents. 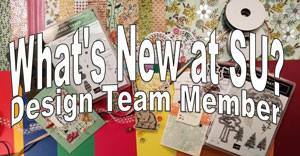 I've already had several new team members who have taken advantage of the amazing deal with the the Stampin' Up! Starter Kit during Sale-A-Bration. 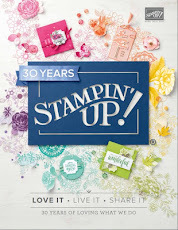 How does $225 worth of any current Stampin' Up! 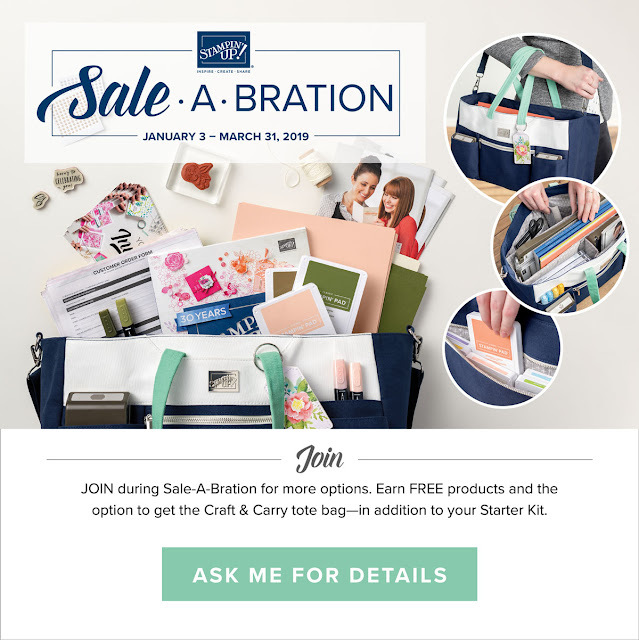 product you want for only $135, FREE SHIPPING, sound to you! Yeah! It's an amazing deal. You can't really afford to pass it, even if you have no intention of selling. 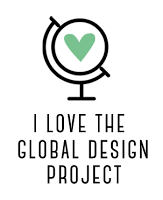 You still get a minimum of 5 months with a 20% discount on your favourite products. 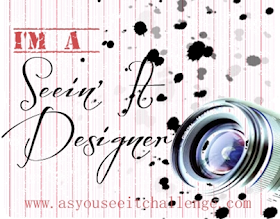 If you're in Canada, go to my top menu and select "Join My Team" and follow the prompts! You can't lose!